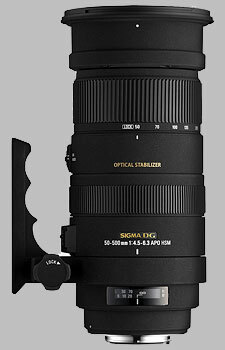 (From Sigma lens literature) The Sigma Corporation is pleased to announce the new Sigma APO 50-500mm F4.5-6.3 DG OS HSM. This is a 10x high zoom ratio ultra telephoto zoom lens incorporating Sigma’s original Optical Stabilizer function. This lens covers a wide range of focal lengths from 50mm to 500mm ultra telephoto. The OS (Optical Stabilizer) function offers the use of shutter speeds approximately 4 stops slower than would otherwise be possible. For Sony and Pentax mount, the built-in OS function of this lens can be used even if the camera body is equipped with an image sensor shift anti-shake system. As compensation for camera shake is visible in the view finder, the photographer can easily check for accurate focus and ensure there is no subject movement. Four SLD (Special Low Dispersion) glass elements provide excellent correction of color aberration. The Super Multi-Layer Coating reduces flare and ghost and ensures high image quality throughout the entire zoom range. This lens has a maximum magnification ratio of 1:3.1 (at the focal length of 200mm) making it ideal for close-up photography. This lens incorporates HSM (Hyper Sonic Motor), ensuring quiet and high speed AF as well as full-time manual focus capability. The addition of the optional 1.4x EX DG or 2x EX DG APO Tele Converters produce a 70-700mm F6.3-8 or a 100-1000mm F9-12.6 MF zoom lens respectively. This lens is equipped with a Petal-type hood to block out extraneous light. The filter size of this lens is φ95mm and the lens is supplied with a step down ring enabling digital cameras with an APS-C size image sensor to use an φ86mm filter. Weight, OS could work quicker, Sigma finish has a reputation of wearing or flaking off. Well, I finally joined the "club" and purchased a used 150-500mm. My serial number started with 103, which from all the research I did, indicated that it was a newer copy, and less likely to have any issues. That, and talking with the previous owner, convinced me to buy. I use it on my D300, and have previously owned a 50-500 Sigma. Today I went out and tested the BigOS, taking the exact same shots at 500mm as I did with the Bigma. Same settings exactly. I put the pictures(jpegs), side by side on my 30" LCD monitor, at a resolution of 2560X1600, and zoomed both to identical size. I could not tell ANY difference between the two, and both were acceptably sharp. I've only had the lens for a day, and just did backyard testing, but it appears to be a winner. Everything the OP said, I agree with. I've owned the same lenses he has, and he was dead on. OS takes about 3/4 of a second to lock on, and is a bit noisy. On the Nikon 70-300VR, it took about 1/4 of a second. On the Nikon, I never could hear the VR, so I was never sure if it was on or not, and had to keep checking the switch. Don't have that problem with the BigOS. But, the noise I'm talking about is almost like a wisper. If you were at an event, you would never hear it. I also compared, side by side, my Tokina 300mm F2.8 lens, which is incredibly sharp, with the BigOS. And again, at F9(sweet spot? ), and 300mm, the two pictures were identical in every way, including sharpness!! This lens is better balanced than the Bigma, and that is on a D300 with grip. As far as price Vs. performance, I give this lens a 10. It has it's place in my bag, and serves a very useful purpose. It's not a prime lens, and doesn't pretend to be, but for 90% of what I do, it works just fine. I use this lens as a complement of my (14-24, 24-70, 80-200 f2.8) Nikon lenses with a Nikon D700 (full frame) camera. The long focal Nikon lenses f4 are not affordable for my budget. The range is very large, this is comfortable allowing not too frequent lens change. I made some comparison switching on & off the OS with a low light inside house during night,a small light and witout support, various f (up to 500) the difference is great ! the test objects were small labels, you are unable to read the text without OS. It is easy with OS. Sometime, it does not work properly (< 5% of cases) and a picture that would be ok witout OS is not usable with it ! It is more or less heavy but only boring after 3 or more hours walk. With 500 mm and 22 opening using 95 mm filter), the angles are cut ! When comparison is made with the (best ?) of Nikon f2.8 you clearly see a difference, the reason of my quality 7. Sumarizing, very interesting for low light but a bit disappointing for outdoor suny days. Bigma is a robust construction ! I wrote "I am wondering to change to a NIKON 80-400 f4.5-5.6 D" on June 16th, finally I will go to a Nikkor 400 f/3.5, an old reference with manual focus (updated 11/11/11) & will comment it asap. P.S. DXO optics pro (soft) does not recognize this lens. After "playing" with the very wide range of the lens, it is clearly amazing, I come to the conclusion that the pictures taken are not in the 1% I love. I generally prefer to uses my Nikkor and...zoom to "increase the focal length !" This lens is very sharp almost to 400mm and sharp at 500mm. Also the edges at 500 are not perfect, but not bad. The focal range from 50 to 500mm is great! The OS work really great. I found mode II work very good on a monopod. The AF didn´t work at all with the 1.4x sigma extender. The AF is very very fast and accurate. Excellent lens, amazing results. No comparaison with the old one. A good investment. Heavy, Slow aperture of f/6.3 and 95mm filter! Once you see the magic that this baby can do you will want one- be warned! I wanted a birding lens with some kind of VR. The Nikkors are all outside my price range, so I had to look at Sigma. The 150-500 they offer had mixed reviews so I checked for reviews on the 50-500 OS which were hard to find. After reading some of the user reviews and seeing some nice pictures I decided to take my chances and buy it. I have no regrets, I love this lens. For me it has the 'wow' factor, I am sure it's not the Nikkor 500mm prime quality, but what it offers satisfies my needs. Take look at http://www.opdatmoment.nl/lesbos/ for some pictures taken with this lens.